I have a great deal of respect for you RW’s out there who have mastered the art of couponing. There are plenty of you who know how to truly get good deals and save money for your families on products you use on a regular basis. Bravo, I am impressed. I am bad at couponing. Not completely useless, but nearly. I only have myself to blame. I don’t put the time and energy into searching out the best deals or cultivating the best coupons. I have no great system. I collect a variety of coupons simply because they have come to me directly, with little effort on my part. 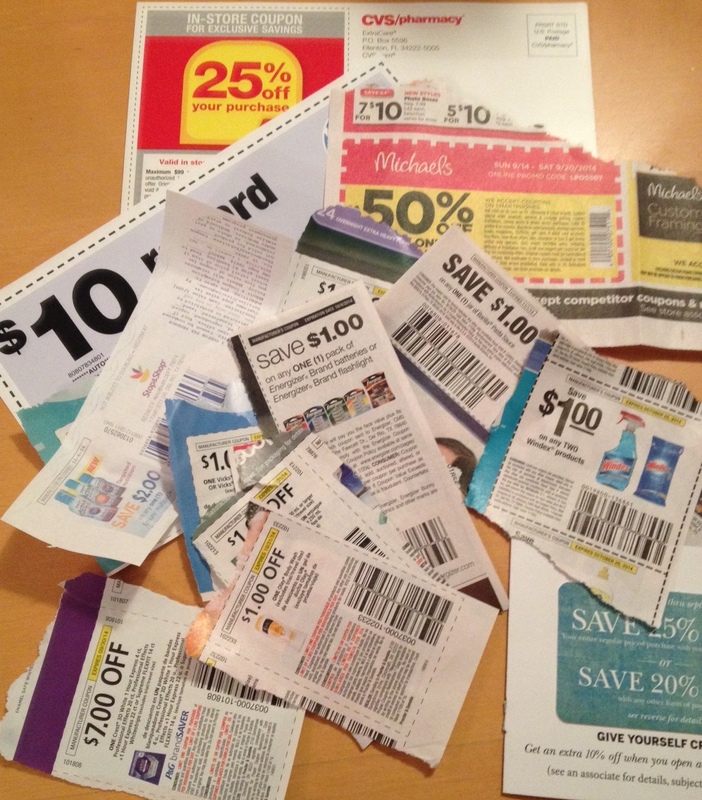 Of these small stacks of coupons that I gather, only an even smaller fraction of them actually get used. I have my reasons…. admittedly, most are not really good reasons, and my lack of participation varies depending on the type of coupon. The majority of these that I collect are from the newspaper and those that are handed to me at the check-out counter. There are times that so many get spit out after my transaction that I wonder if I could use them for wallpaper. Clearly a sign that not only do I spend far too much time and money in the grocery store, but… they’ve been watching me. The system cranks out coupons based on my buying habits and products I frequent. Scary. I then pile the coupons in a messy little stack in the desk organizer on my kitchen counter. If I remember, I will flip through them before I head to the store – and if any look appropriate, or haven’t expired, I may actually remember to bring them with me. I see successful couponers traveling the aisles with their very own filing system in hand, just like my mom did. Not me… the handful I might bring with me end up in a waded up pile in my purse or pocket, or tucked under the lettuce in the top of my grocery cart. I hope the file-system people don’t notice. They would be appalled. The majority of the time, I find a different brand, or store brand, that is still less expensive than the brand for which I have a coupon. OR, I realize that I have to buy 6 of something to get $1 off. Who needs 6? OR, the exact product variety or size stated on the coupon is not in stock at the store. So back to the pocket those coupons go. By the time I work my way up to the cashier, I have just one or two coupons that I can actually use. Which, of course, can be rather embarrassing, given the quantity of groceries I am purchasing. So I end up trying to make a joke with the cashier, like “gee that $ .75 sure is going to make a dent on this bill!”. Usually they are not amused. These I generally acquire through the mail. At one point in my life I did a lot of catalog shopping, and those retailers have never forgotten about me. Similarly, I have rewards cards for the shops I frequent. Each of these retailers like to send me love notes, or catalogs, both accompanied by promises of percentages off if I would be so kind to visit them again. Of course, these same retailers send me e-love notes. Lots of them. My personal email account is filled every day with offers to “stock up now”, “order today to get an additional 20% off”, or “buy one, get one half off.” The majority of these e-love notes get deleted. I just don’t have the time or interest to wade through them. Again, if I put the effort in, I’m sure the rewards would be lovely. So my gift cards and coupons from retail shops get stacked together in yet another spot of my kitchen counter, under my car keys. My logic of course there is that before I head out to do some shopping, I’ll browse through the stack. I used to carry all of these coupons and offers with me – but they only succeeded in making my purse fat and getting in the way. In reality, when I stop to sort through the stack, I end up disposing of at least half of them because they’ve expired before I’ve gotten a chance to use them. These are the coupons that are printed out at the bottom of receipts from certain stores, to be used during your next visit. CVS is the king of this. Every time I shop at CVS and use my rewards card, I get coupons and offers in return. Even better, some times I get dollars off anything at my next visit. For some reason, I’ve decided the best place to store these coupons is crammed into the back of my checkbook. I guess this is because I go to the drug store, or craft store, or wherever else I get these receipt coupons, so often that I may as well keep them with me. I seem to do pretty well with these coupons. Well, that is, when I remember to look for them before cashing out. And if they aren’t all expired due to lack of attention. I recently, rather by accident, caught part of an episode of “Extreme Couponing” on TV. I was in shock. These people seem to devote their lives to the whole process. And what I really don’t understand is the quantity of goods they store in their homes because of the great deals they get. Does anyone REALLY need a 5-year supply of toothpaste? I could never in my wildest dreams be that fanatical. Besides, I basically hate grocery shopping, so anything that requires me putting in MORE time there is out. And so, I limp along, really not being terribly successful in achieving great deals or savings. Maybe some day I’ll find the time to get better at it. I could at least perhaps be one of those RW’s who will stop at 3 different stores to get the best deals, or who has alphabetized coupons in a cute folder, or goes beyond the newspaper and mailbox to obtain coupons. Maybe. Tonight I used 5 whole coupons at the grocery store, and saved $6 off my nearly $300 bill. That just may be my new personal best. There could be hope for me yet. This entry was posted in Chores, Food and tagged coupons, deals, groceries, rewards, shopping, special offers. Bookmark the permalink.